After a night of debauchery, five military buddies wake up in the drunk tank only to find out that while they were passed out in their cell the Zombie Apocalypse kicked off. Armed only with billy clubs and their military experience, they break out of prison and fight their way to their old base. Along the way, they pick up a whole lot of weapons, a couple of damsels in distress, and accidentally, the cure. Getting to the base, however, is only the beginning of their nightmare. 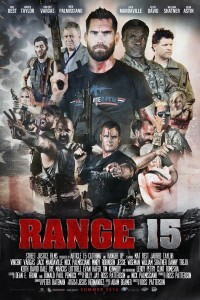 Once there, their old boss, Colonel Holloway informs them that the only place that can synthesize the cure is Range 15, an isolated facility some 300 miles away, through zombie-infested desert. And to make matters worse, the zombies are getting faster with each hour, and Colonel Holloway is sending narcissistic super soldier, Gene Vandenham to lead the mission. They woke up that morning fighting hangovers. Now the fate of the world hangs over their ability to fight. Whether they’ll make it or not is anyone’s guess, but one thing is for certain, after watching these guys try to save the world, you’ll never thank another veteran for their service again.